Woodlands a été construit en 1905 comme la résidence de campagne de gentlemen. Il se trouve à la fin d'une route tranquille dix minutes à pied de la pittoresque village Giggleswick dans le Yorkshire Dales National Park. Bois de l'enchanteur Seigneur borde la maison à l'ouest et il ya des vues spectaculaires depuis la terrasse sur la vallée de Ribble à l'est. A 15 minutes à pied vers le bas Les Mains vous emmène à la jolie ville de Settle du marché, avec des magasins, restaurants, cafés et pubs, ainsi que d'une piscine sur le théâtre et la natation. Maison salle de bains, salle de douche et salle de suites. Notes sur l'hébergement: La maison peut accueillir 19 personnes dans 10 chambres avec des lits confortables. Chiens et enfants bien élevés sont les bienvenus. Pauses en milieu de semaine à partir de £ 750 pour 4 nuits - idéal pour les jours à l'extérieur des entreprises ou des vacances de marche. Dehors: La maison est située dans les jardins boisés matures, il ya 2 petites pelouses et une grande terrasse donnant sur la vallée. Repas en plein air pour les 20 plus. 2 barbecues. Il ya un chemin privé discret pour accéder à la piscine intérieure locale à proximité. Buanderie: Pantry, lave-linge, micro-ondes, plaque de cuisson à gaz, four, réfrigérateur / congélateur. Séparée salle de séchage. Autre: Dessin à manger, grande cheminée feu de bois, vue sur la terrasse à la Vallée de Ribble TV / DVD / CD. The property affords relaxed grandeur in the multiple reception rooms, plenty of accommodation in the mixture of bedrooms, lovely views with the ever-changing light across the valley, and plenty of parking. Walks and cycle routes start from the door, and the facilities of Settle are just a short stroll away. David responded quickly to enquiries, and the property was in great shape when we arrived. As a meeting point for a re-union of friends from Scotland, Wales, Isle of Man, London and NW England this proved, yet again, a winning location. Really enjoyed our stay at this home where we celebrated a big family birthday. Rooms were spacious, clean, and comfortable. The showers weren’t very powerful but adequate and plenty of hot water. Lovely dining room with large table, and candles provided. 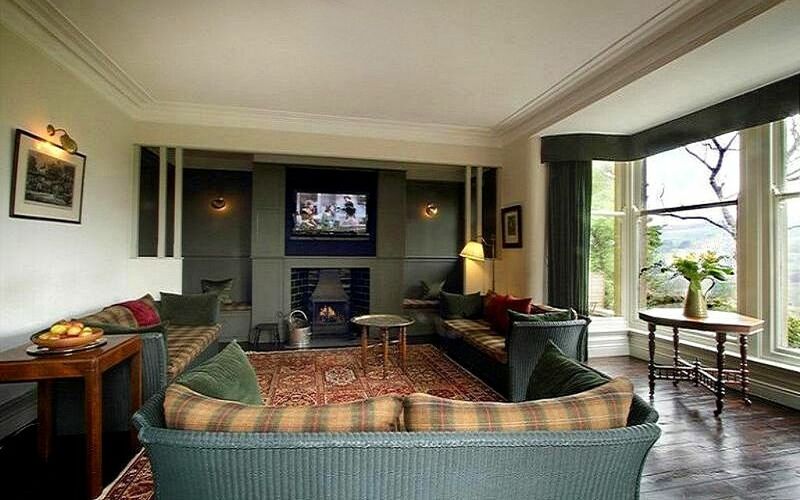 Open fire or log burner in rooms added to the warm atmosphere. We struggled a bit with cooking as the large range oven didn’t circulate air well and the uneven heat complicated our meal preparations, but in contrast the large hob was great. We’d have liked that the kitchenware had been cleaner as a number of things needing washing for use, and we’d have liked to have some modern kitchen scales too. The only other thing that let us down a little was the lack of really comfy armchairs & sofas downstairs. Younger members had no issues, but the elderly members of our party found the wicker furniture lacking in comfort and support. However, the spacious facilities and lovely views and outside dining, and plentiful parking spaces made up for any shortfalls. Added to that the house is in a brilliant location, lovely and quiet with amazing views of the hills and surrounding countryside, yet close to a pub and only around 10 minutes walk to the town centre, shops, cafes, river, etc. Lots of walking, cycling, and site seeing in the vicinity and within short driving distance. Overall we were really pleased with the accommodation and had a very happy and memorable family get together. Beautiful house. Perfect for a family reunion. The house gave us plenty of room to cook, eat and socialise together, and to back off and have our own space as well. Loads of crockery, cutlery, pots and pans and not in want of anything. Lovely walks straight from the house. All in all perfect! Very expensive for what it was - lots of things were broken or not working....sorry! I always, without exception appreciate feedback, so thanks for taking the time to review and thanks for your detailed list. I'd like to address your feedback as clearly as possible. With regard to price, the house sleeps 19 guests and is set up for family holidays, your group of 8 would have found much better value somewhere. I believe I keep up with maintenance efficiently and the house is checked each week by the house keepers, but it's inevitable that we sometimes miss things and rely on feedback to get things right. There are 2 dishwashers, I was aware of a recent compliant for one of them. They have both been replaced with new. There are 2 kettles, you are the first guests to mention the switch being difficult to operate. The cleaners use the electric kettle each week and it's not a problem we can identify, but I'll keep an eye on it. There are 3 fridges, I'm sorry you had a problem with the main fridge. I live at the back of the house and could have helped if you asked. You had turned the fridge off by mistake. The vacuum cleaner plug getting hot is not something I can get to the bottom of, it's one of 2 used each week - we'll keep an eye on it. Main bathroom and attic WC- apologies for the a bulb not working, both have been replaced. There are 4 light bulbs in the cooker extractor, I have replaced the one not working. You found the lighting levels in the sitting room inadequate - I apologise, this maybe my personal preference to have relatively low lighting levels, but I want the house to be fit for a variety of uses, so have changed the bulbs in the standard lamps as a compromise. The loose seat in one of the bedrooms has been fixed. Wet-room Wc flush - I agree is a little harder than the pneumatic flushes in some of the other bathrooms - but despite being older I believe it works well for an older Wc.. But I think this is subjective - so I'll keep an eye on it and if more people have problems with it I'll do something about it. You titled your review "faded glory" - In part this is what I have tried to achieve - but it is a balance. I believe the house is well maintained and meticulously cleaned and prepared each week. I'm sorry it fell short of your expectations. We have over 1,000 guests a year and all groups are different but I do believe the website content and photographs are a good indication of what to expect. Once again, I do genuinely appreciate your feed back. Great house! It has everything you need and David is a great host! We had booked this property to celebrate my husband's 60th birthday with a group of friends. What a fabulous weekend we had. Woodlands House is a lovely house set in lovely countryside. David and his band of cleaners were there when we arrived on the Friday afternoon, they were very welcoming and greeted us with friendly smiles. We found Woodlands House to be a clean and well equipped for our stay. The kitchen facilities were spot on. We hope to come again in the not too distant future. Pauses Walking - nous offrons milieu pauses semaine de marche à partir de 950 € - il ya beaucoup de grandes promenades de la maison, nous pouvons vous conseiller ou même vous fournir un guide de promenade. Parfait pour les Yorkshire 3 Peaks. Leeds Bradford International est 1 heure en voiture. 2 stations, Settle et Giggleswick, à la fois avec des trains à destination de Leeds (1 heure) ou de Carlisle (1 heure 30). Settle est à 20 minutes à pied, pubs, restaurants, pubs, cafés, boutiques, marché de la piscine. Il ya un bon pub avec de la nourriture dans Giggleswick, à dix minutes à pied de la maison.